Principle provided branded graphics for both interior and exterior signage elements. 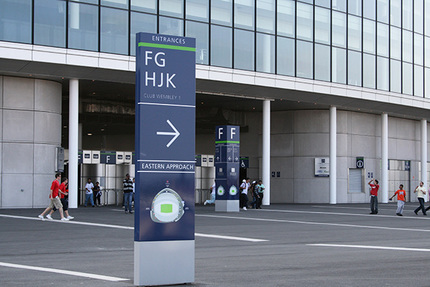 Wayfinding and signage is crucial in a venue as large as Wembley and the site’s requirements were many and varied. Everything from fire exit signs to large-scale graphics for champagne bars were identified during the planning stages. Our team developed, produced and installed all aspects of the facility. The programme was successfully delivered with more than 10,000 signs and graphics at the site within the scheduled six-month implementation window. The end result of the largest single-site branding project ever undertaken in the UK, is that crowds in excess of 90,000 can easily find their way around the huge stadium.